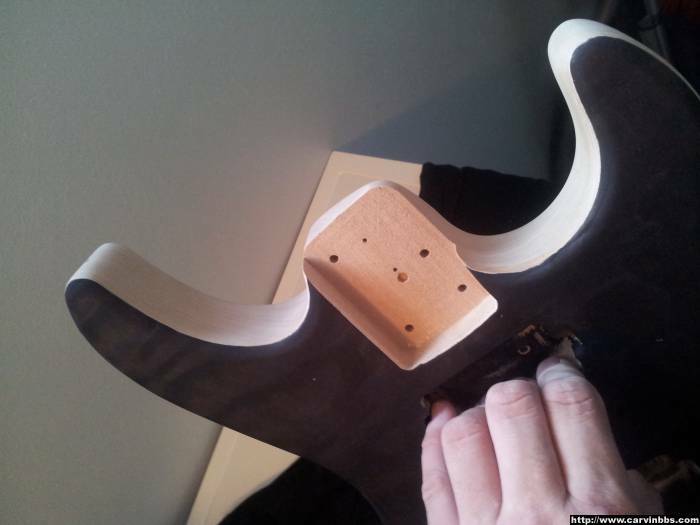 The ebony neck has a couple of stripes that are almost bronzed. Some would say that the ebony is imperfect, but I see it as character. The bronze colour is unbelievable, and goes well with the MOP dots. I was hoping for a nice piece of bookmatched quilt, and I was NOT disappointed! 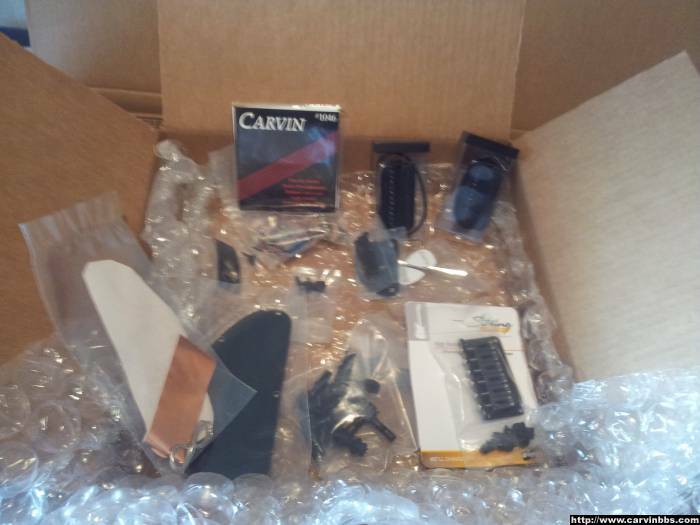 Thank you Carvin woodshop! 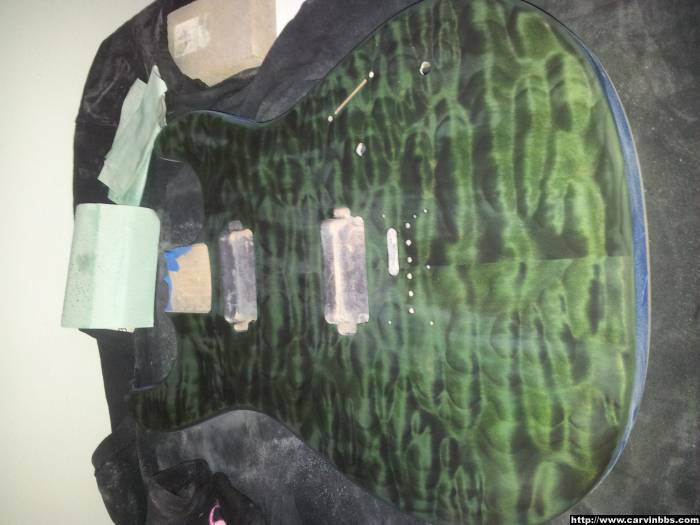 I am thinking DTS greenburst, but I must do this piece of wood justice. 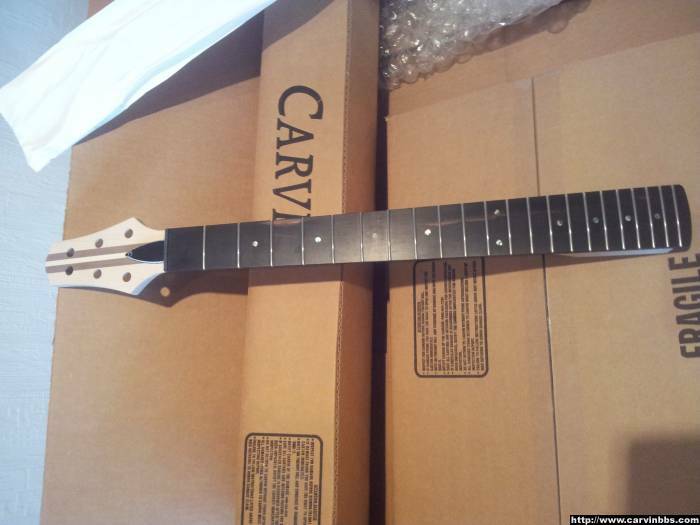 I am also contemplating doing a greenburst on the headstock as well. That top is going to look AMAZING once it's stained. I love the vertical lines running through the quilt. I know you've been set on a green burst for a while, but I think this top would look absolutely killer with a mild vintage / honey burst as well. Either way, your going to end up with a great bolt. 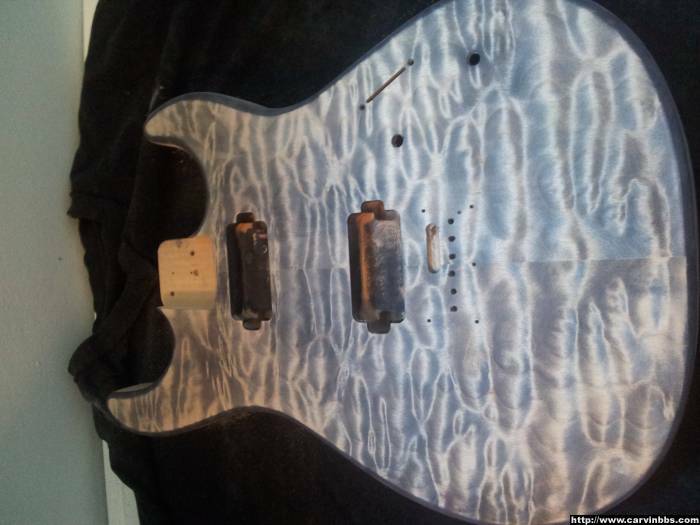 nice top on that, and nice neck, keep us posted on the progress!!! What about a lighter brown stain on it? Like something lighter than the antique brown that Carvin offers. Very nice bookmatch on that top wood - I wish Carvin could guarantee as good a match on every guitar, however it isn't possible. Be happy yours turned out so good. I really like the streaks in the fretboard! And NICE quilt! twilightdusk wrote: What about a lighter brown stain on it? Like something lighter than the antique brown that Carvin offers. YESS! That would look great. 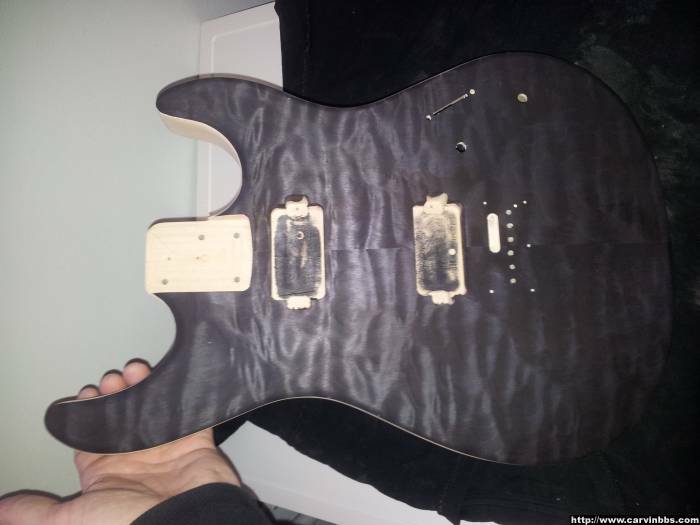 Are you going with a high gloss, or tung oil finish on the body? I will go with Tru-Oil gloss. Finally I got something done. 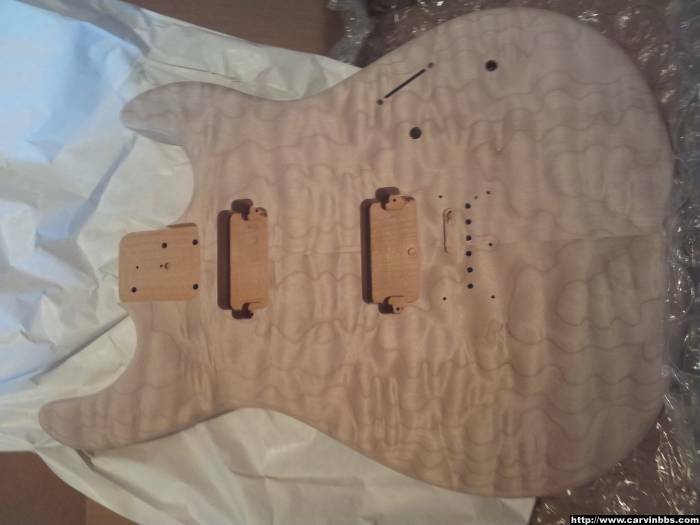 I think I will keep the alder natural wood, and just stain the quilted maple top. The plan now, is to sand down again, and then stain the top green. Then make a black bursted edge. Then Tru-Oil. I will also have to be more careful with the masking, and making sure I get an even colour. Just remember NOT to rush things and be patient! Sure you don't want black? Looks pretty good already. Does look good. Nice work sir! But it seems that I have been a little too eager to sand, so I have to stain it again, and then sand it again. I vote for black stain and gloss! That is a beautiful top. Wow, that's n awesome top! 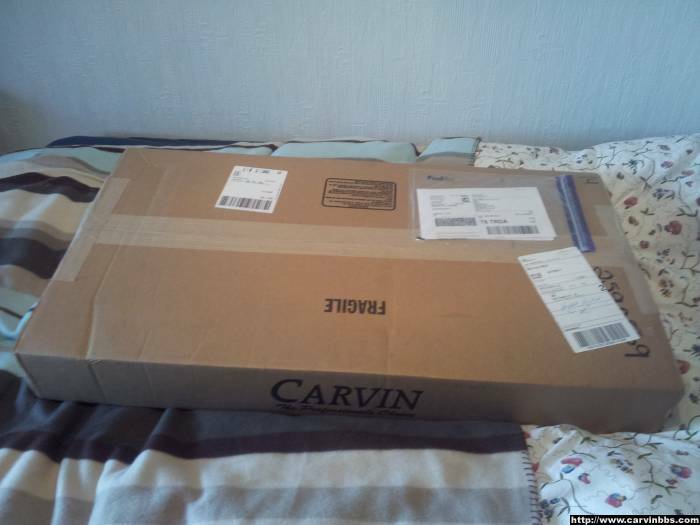 My vote goes for a lil light than Carvin's antique brown. Do something unique that will stand out!